A couple of years ago, my shoulder and back was a total mess from holding Waves, my daughter, on one side constantly and always reaching back to hand her things when she was in her car seat. The pain radiated from my shoulder all the way down to my elbow most days. It got so bad that I couldn't ignore it any longer and began my search for a physical therapist. It took me almost an entire year to make a physical therapy appointment. If you're in pain, don't be like me.. make the appointment now! And if you're in the Chattanooga area and need a recommendation, e-mail me and I'll give you the info for the fantastic PT I went to. After my initial appointment, I found out what was going on and also that my back was extremely weak. The plan was to do a set of exercises at home that would strengthen everything. The PT I went to filmed me on my phone doing all the exercises in her office with her instruction so that I would have something to reference when I was home. That was so awesome because it guaranteed my form was perfect so that the exercises would be effective. 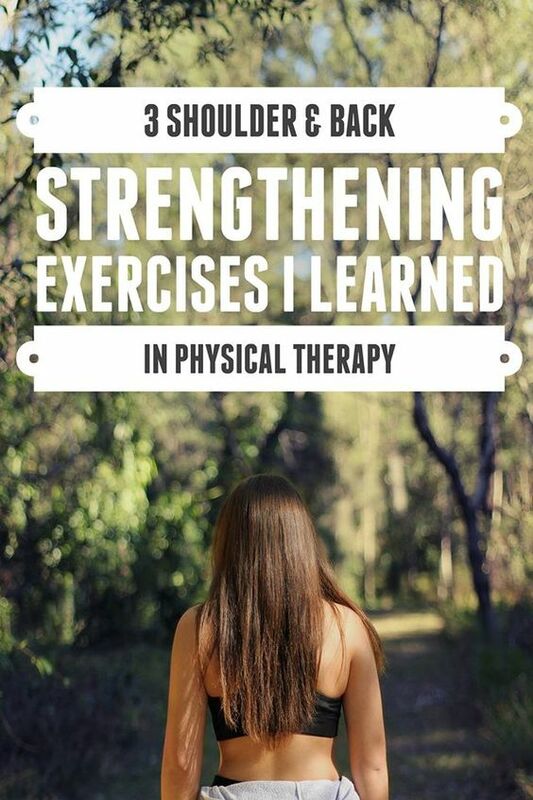 I wanted to share some of my favorite exercises from my sessions - it only took 4 of them until my pain was manageable, btw. And if I ever feel any pain creeping back, I do my exercises and it's taken care of. Now, obviously I'm not a doctor or PT myself and you should always consult a medical professional before you begin any exercise program. One of the things that was stressed to me was the importance of activating the scapula before beginning any of the exercises. It gets everything in the right position so you can perform all the moves safely and properly. Stability Ball L's /// This one seems like it's not doing much, but believe me.. it is! Ab Wheel Roll Outs with a Foam Roller /// This one is great at strengthening, plus the stretch feels soooo good! I bought this foam roller on Amazon ~3 years ago and it's still in perfect shape. Definitely recommend it! Again, don't wait on seeing a doctor or PT if you're in pain. They can make a plan tailored to your specific needs and get you healed quickly. 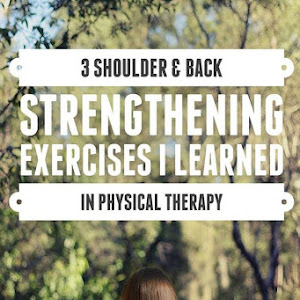 But if you're looking for a few new shoulder and back exercises to add into your routine, give one of these a try! I was given some exercises a few years back that help me at times. I will definitely have to try these! It's so nice that whenever something starts acting up, you can just go back to the exercises you were given and it helps so much! Need to try some of these, that's for sure! Can't wait to check out the videos. I'll have to try some of these techniques because I usually have back pain sometimes and I have to have my sister crack my back because it aches so much. It's such a pain. Oh, I hate to hear that :[ I also bought this book on Amazon called "Trigger Point Therapy Workbook" and it is amazing in helping relieve pain. I hope you find relief! These look like great strengthening exercises! Sending this to a friend who deals with a lot of back pain. Awesome, thanks! I hope your friends back pain gets better quickly! Spring Break in Gatlinburg & a Trip to Dollywood!